Iron ore sinks below $130 for the first time in 148 trading days and coking coal breaks long-held industry rule of thumb and dips below the iron ore price. The price of iron ore slumped to a 6-month low on Tuesday, breaking below the $130 level for the first time since July. The benchmark CFR import price of 62% iron ore fines at China's Tianjin port fell more than 1% to $129.50 a tonne on Tuesday, a level last seen July 16 and down 3.5% since the start of the year according to data supplied by The Steel Index (TSI). Compared to previous years – 2011 and 2012 saw $60 a tonne crashes over not much more than a month of trading – the iron ore market was uncommonly stable last year, particularly in the second half with the steelmaking ingredient trading between $130 and $140 a tonne for 148 days straight. TSI's Tianjin price index is used as the basis for many physical term contracts and also as the settlement for swaps, options and futures listed on the Singapore Exchange (SGX) and other exchanges. While still a relatively small part of the iron ore trade volumes of iron ore derivatives have soared in recent years. SGX, which dominates the market, enjoyed a doubling of swaps volumes cleared in 2013 to nearly 230 million tonnes, while options volumes and open interest grew exponentially. Futures, newly launched on SGX in April 2013, saw monthly volumes increase by more than 25 times to 2.2 million tonnes in December. The forward price indicators from Singapore aren't great either. In a research note The Steel Index points out that the forward curve for iron ore on SGX dipped under $130 a tonne for the January contract for the first time last week and currently trends downwards along the curve to under $120 a tonne by May this year. After a 10% jump to a record 820 million tonnes last year, China now consumes almost three-quarters of the global seaborne iron ore trade which for 2013 is estimated at just over 1.1 billion tonnes. The country manufactures almost as much steel as the rest of the world combined with its blast furnaces pumping out steel at a record-setting rate of 2.1 million tonnes per day, a 9.4% increase over 2012. But dumping that much product onto the market comes at a price and China's Iron and Steel Association reports average profitably among large domestic mills to be under 0.5%. A slowdown in Chinese steel production this year appears inevitable amid overproduction, a crackdown by authorities on the industry over environmental concerns and weaker domestic demand. Clouding the outlook further is a rise in Chinese iron ore stockpiles to 88.6 million tonnes in December, up a whopping 21% from a year ago, and an expected 22% jump in exports from Australia and strong production growth in Brazil after two stagnant years. 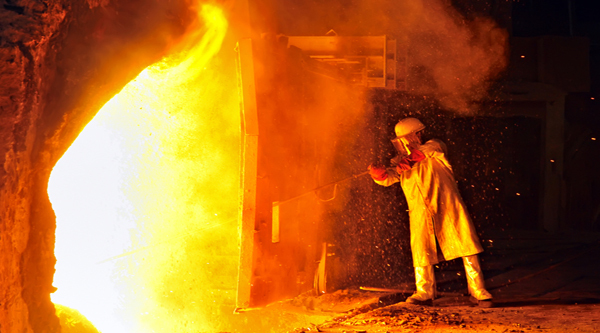 The other crucial ingredient in the steelmaking process, coking coal is also under pressure. TSI's prices for premium hard coking coal (FOB Australian east coast exports) has trended downwards since reaching $151.10 a tonne in the middle of September last year, dipping as low as $130.30 a tonne this week, before a tick upwards on Tuesday. After hitting a high of $172 a tonne in February 2013, premium met coal prices have been lower than the benchmark iron ore index for four of the last six trading days against "a long-held rule of thumb that coking coal prices are higher than those of iron ore," says TSI.